At the end of the summer in 2015, WISC Channel 3’s Neil Heinen talked with Region 6 members Gina Pagel, Kirah Zeilinger and Brad Klotz about the state of public education and the strength of our union. In May 2016, the Wisconsin State Journal reported on how Oregon Education Association president and life science teacher Tracey Leider heads up an annual food drive to illustrate how much time teachers spend preparing for class outside the work day. In September 2015, the Wisconsin State Journal interviewed Region 6 president Mark Lindsey for an article about legislative proposals to diminish the state’s public employee pension system. 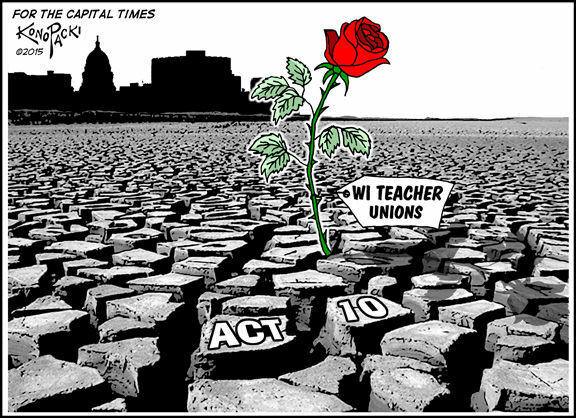 In February 2015, several Region 6 leaders spoke to the Wisconsin State Journal about how the union is organizing and winning at the local level to overcome anti-education state legislation.